House of England Event - corgis to be honorary guests! Colette and Tucker & Tate, Geri, Robin E.
Imagine 90 stubby corgis frolicking in the park or running thru the surf. Now imagine their owners laughing and discussing what makes them similar and what makes them separate personalities. That's what this meetup is all about. Come join us and just maybe you'll share a laugh or two while watching our big dogs with short legs play. 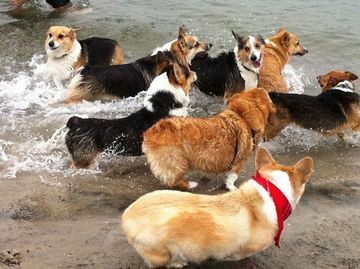 Our main Corgi Meetup happens once monthly, on the 4th Saturday of the month. We also have mini-meetups scheduled regularly, and any member can suggest a new Meetup. For about two hours, our corgis romp together, while us humans mingle. This is a great opportunity to bond with your corgi companion while practicing socialization skills and showing off your pride and joy! We will be meeting at various venues around San Diego. Please join us. Everyone is welcome.